When Charles Ⅹ and his ministers threatened to bypass the elected legislature and start taxing and spending on their own initiative in 1829 , French liberals declared that since such actions violated the constitution, the people were under no obligation to pay for them with their taxes. Taxed landholders in Brittany formed the “Breton Association” to coordinate their resistance. This Association had a two-fold object. They proposed, in the first place, to refuse to pay any illegal tax, and in the second place to raise by contribution a common fund for indemnifying any subscriber, whose property or person might suffer by reason of his refusal. The members subscribed each ten francs. In the event of any tax being imposed without the consent of the Chambers, or with the consent of a Chamber of Deputies created by any illegal alteration of the existing law, payment of the tax was to be refused, and the money subscribed was to be employed in defending and indemnifying the persons who should so refuse, and to prosecute all who might be concerned in the imposing, or the levying of such illegal taxes. Elias Rishmawi was among those who organized tax resistance in Beit Sahour during the first intifada. He remembers how important it was to have formed a network of committees so as to distribute communication and decision-making in anticipation of Israeli military disruption by means of curfews and arrests of the resistance leadership. Direct action-oriented pacifists in the United States came together in the late 1940s to form Peacemakers. “[T]his is not an attempt to organize another pacifist membership organization, which one joins by signing a statement or paying a membership fee,” they announced. By 1949 the group had about 2,000 members, about 150 of which were resisting taxes. A second group, War Tax Resistance, promoted the tactic within the anti-Vietnam War activist community. In 1982 , the National War Tax Resistance Coordinating Committee formed to help a variety of groups that included war tax resistance as part of their work to coordinate and share resources and expertise. During the Great Depression in the United States, taxpayers’ leagues, some of which organized property tax strikes, proliferated in the thousands. Such groups “spring up like mushrooms,” one critic complained, “every time you go out in the morning, you find more of them.” These leagues attacked the taxes on multiple fronts — not only organizing tax strikes but also coordinating legal suits and pressuring political figures. That in the event of the present ministers so misconducting the affairs of the country as to make it probable we shall be involved in a Continental war [with Belgium], we will consider the propriety of checking so mischievous an event by withholding the means as far as may lay in our power, and will then consider whether or not refusing to pay direct taxes may not be advisable. 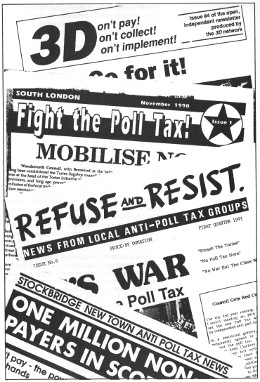 A variety of local groups, with independent organizations, were key to the victory of the Anti-Poll Tax movement. In Danny Burns’s book on the Poll Tax Rebellion, he stresses how important it was for the success of the campaign that people formed and ran their own small-scale, neighbor­hood resistance groups, rather than ceding control of the movement to the various established left-wing partisan and labor-union groups who wanted to use the movement to their own ends but were also afraid to identify themselves too closely with the law-breaking resisters. Prior to the Anti-Poll Tax campaign, many people’s only experience of politics was a traditional Labour Party or trade union meeting — the sort of meeting where the top table takes up 90% of the discussion; where the only items discussed are those decided by the executive committee; where half the meeting time is spent discussing procedural motions or the order of words in a resolution; where political factions throw rhetoric across the room in angry and unproductive exchanges. Essentially, boring meetings which stretch long into the night. Hundreds of thousands of people have been to these meetings just once and never returned. To engage people in a mass campaign, the Anti-Poll Tax Unions had to challenge this culture of organisation. They had to make people feel wanted and included and give everyone a sense that they had a role.… This immediate form of organisation also meant that people weren’t patronised by those who had political experience. In the local groups, people didn’t need permission to act, they just had to get on the phone to their neighbours and get something going. People stay involved in political campaigns if they can contribute in the way that they feel is most effective. Very often this is not by sitting in boring meetings. …most of the successful Anti-Poll Tax Unions operated on a principle of parallel development. Rather than trying to assert majority control or spend hours reaching consensus, people were allowed to get on with what they thought was most important. Everything could be done in the name of the Anti-Poll Tax Union, which existed to coordinate activity against the Poll Tax, not to specify its exact nature. …it was sometimes in the places where the Anti-Poll Tax Unions were weakest that resistance was strongest. For example, St. Pauls was almost the only area in Bristol which couldn’t sustain an Anti-Poll Tax group. Local people didn’t feel the need to set up new groups because, as in many inner city areas, they already had strong networks of solidarity, and there was already a high level of general hostility to officials of any sort. … By the end of 1990 , three times as many people had turned up to court to contest their cases from St. Pauls than any other area. White supremacists in Louisiana met in 1872 to form “The People’s Association to Resist Unconstitutional Taxation” to coordinate their resistance to state and city taxes enacted by the reconstruction government there, and to provide legal support for resisters. News accounts of organized tax strikes in Austria in 1931 and in Ontario in 1981. Some tax resistance campaigns have supplemented their illegal tax resistance by helping people learn legal tax avoidance strategies. Here are some examples.